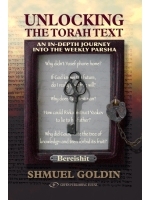 Unlocking the Torah Text provides an in-depth journey into the Torah portion through a series of studies on each parsha. Each study opens with a brief summary of the narrative and then presents probing questions designed to strike to the core of the text. These questions are addressed through a review of traditional commentaries spanning the ages, combined with original approaches. Deep philosophical issues and perplexing textual questions are carefully examined and discussed in clear and incisive fashion. The actions and motivations of the patriarchs, matriarchs and other biblical figures are probed with an eye towards determining the lessons to be learned from the lives of these great personalities. Clear distinction is made between pshat (straightforward literal meaning) and Midrash (rabbinical exegesis) as both of these approaches to biblical text are carefully defined and applied. Finally, thought-provoking connections are raised between the eternal Torah narrative and critical issues of our time. Each study is thus constructed to encourage continued discussion and study of the Torah narrative. RABBI SHMUEL GOLDIN received his BS in psychology and his MA in Jewish education from Yeshiva University, and his rabbinic ordination from the Isaac Elchanan Theological Seminary of Yeshiva University. He has served as spiritual leader of Congregation Ahavath Torah in Englewood, New Jersey, since 1984. He is an instructor of Bible and Philosophy at the Isaac Breuer College and the James Striar School of Yeshiva University, founding director of and lecturer at The Eve Flechner Torah Institute, and past president and board member of numerous organizations. Noted as one of the most articulate spokesmen in the Orthodox community today, Rabbi Goldin has developed an innovative educational approach to Torah study, Jewish law and Jewish identity which is enthusiastically received by traditional and non-traditional Jews alike. Rabbi Goldin and his wife Barbara are the proud parents of five children, and grandparents of two. Rabbi Shmuel Goldin has rendered an extraordinary service… Challenging us with fascinating questions, he presents unique solutions to problems that wemight never have noticed but which are critical to our understanding of the text. Sabbath discussions in the pulpit or around the table will be greatly enriched by his analysis.